A real honour to photograph Norman Scott for the Times article, 12th April 2018. The full story, beautifully penned by Helen Rumbelow, is available on the Times website. Norman’s incredible story about his then scandalous affair with Jeremy Thorpe in 1970’s, and his attempted assassination has been made into a BBC series, A Very English Scandal, due out shortly. It boasts Ben Whishaw as Norman and Hugh Grant as Jeremy and promises to as moving as it is gripping. Having heard so much of Norman’s story first hand, I can’t wait to see it. 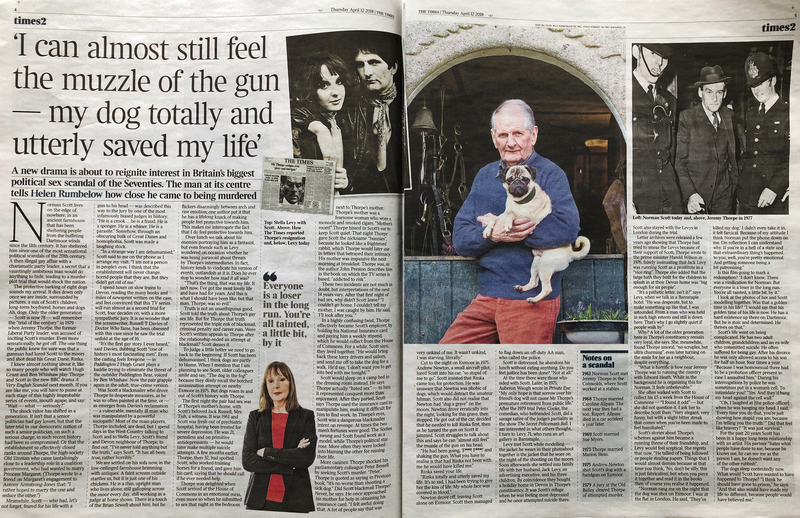 Dogs and horses play a strong part in Norman’s life in Devon – indeed it was his dog Rinka who took the bullet instead of Norman on the chilling night of his attempted assassination on Exmoor. So it seemed only fitting to photograph Norman with one of his many dogs for this portrait, in this case Pugsy, a rescue dog from a holiday in Cyprus. 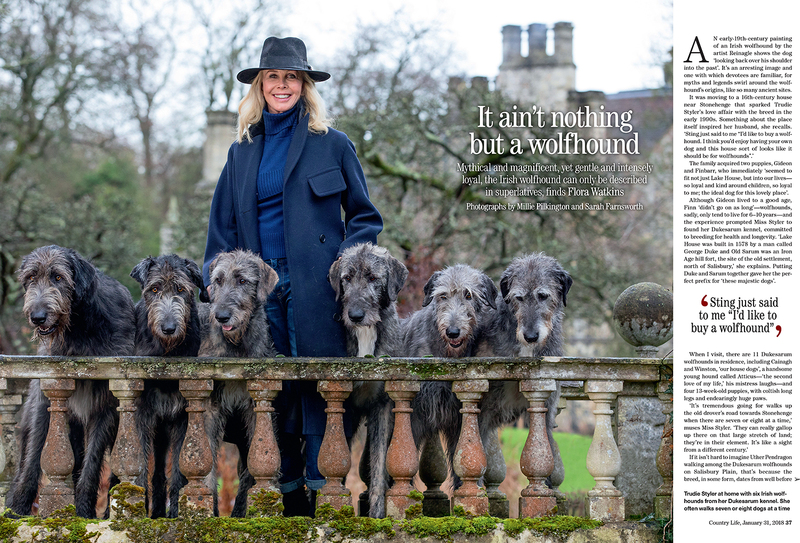 This portrait of Trudie Styler for Country Life Magazine’s feature on Irish Wolfhounds, was taken at Trudie and Sting’s residence in Wiltshire on a filthy winter’s day in December. Portrait photography in the rain is always a challenge. Standing in a fast running river with water flowing in over the brim of my wellies, Lucy precariously holding my lighting in strong gusts of wind, 6 irish wolfounds on a bridge eyeing up potential fun in the water below, all whilst being overlooked by Sting – made it all the more exciting! Trudie also had her hands full with these enormous hounds so I’m not sure who was more relieved when all the elements came together within a few minutes and we captured the shot without any of the wolfhounds joining Lucy and I for a splash! 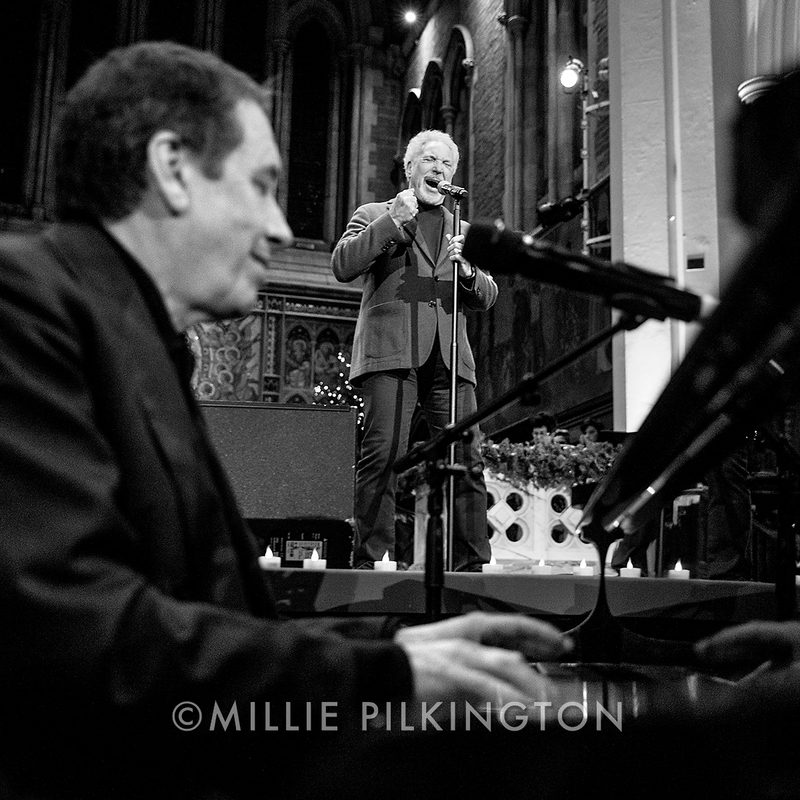 This was a truly memorable evening in aid of www.childbereavementuk.org, with performances & contributions from musicians, actors and authors including: Sir Tom Jones and Jools Holland, Bill Nighy, Ben and Marina Fogle, Brendan Cox, Michael Morpurgo, the Taplow Youth Choir and The African Gospel Choir. 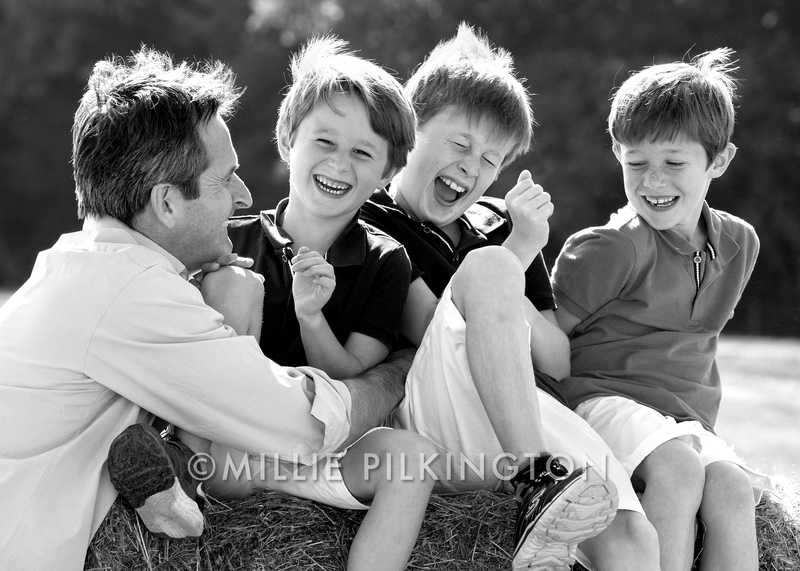 As a portrait photographer specialising in children photography, a mother of three gorgeous girls and wife to a wonderful husband, I am aware of how lucky I am. It is a wonderful to give back to a charity providing a lifeline to bereaved families. My aim was create an informal portrait from an angle which best displayed these ‘layers of history’, with particular focus on the juxtaposition between the bare brick and remaining plaster. What you can’t see are the two new layers of history on the carpet where Hettie (taking pride of place on the chair) was sick when she came in! 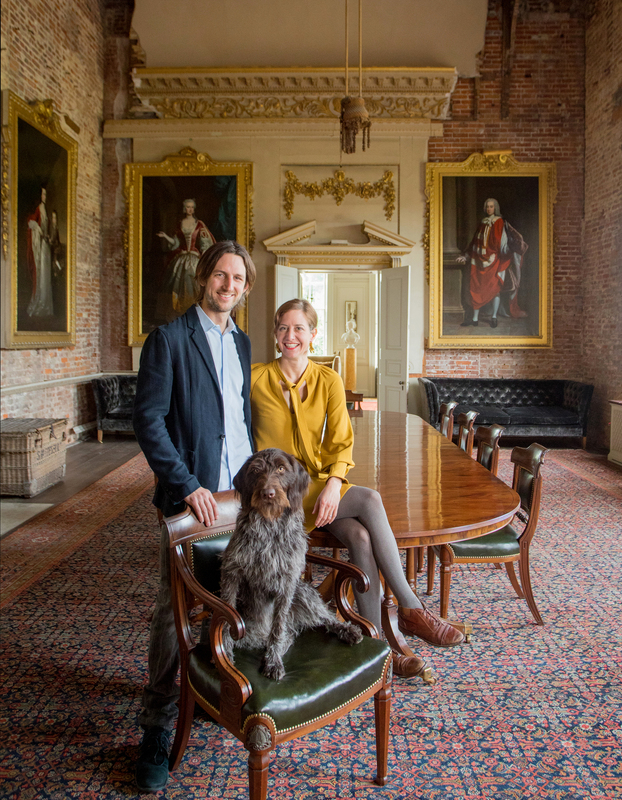 Another very enjoyable portrait commission from Country Life Magazine: photographing Cecily Offord at home in Devon for the frontispiece with my great friend and very talented make up artist Amanda Jackson Sytner. Although the weather was rather dreary, the light was soft and there was little wind – so great conditions for portrait photography. The only set back with soft lighting is that it’s flat and lacking in shadow which adds a depth and mood I love particularly in close up portraiture. However, I found an ideal location under a pergola offering opportunity for creating soft shadows, a lovely wall with plants growing up in the background, and soft light flowing in from the front and right. I positioned the chair towards the front on the right, where there was sufficient light behind to avoid her her being lost in the dark background, and angled it so as create some soft shadow on the left of Cecily (from the viewer’s perspective). We then worked through a variety of poses on & around the chair, which resulted in a wonderful selection of stunning portraits. The combination of a stunning model, make up, red velvet jacket and set up all worked in my favour. The one Country Life chose is but one of my many favourites. 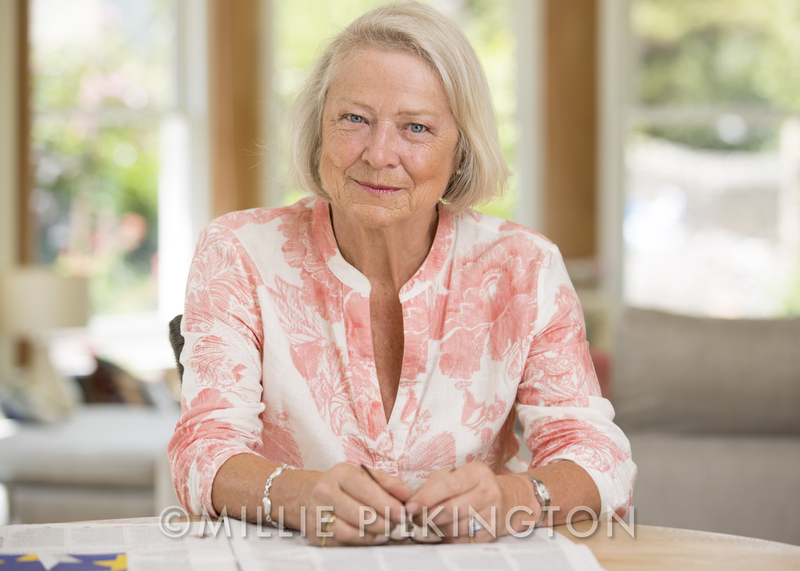 What a privilege to return to photograph Kate Adie in her home town in Dorset, this time for a feature I was covering for Country Life Magazine, out this month. At 71 she looks incredible – perhaps her secret is keeping busy. Although her days of being a war correspondent may be over, she is certainly not one to sit still. 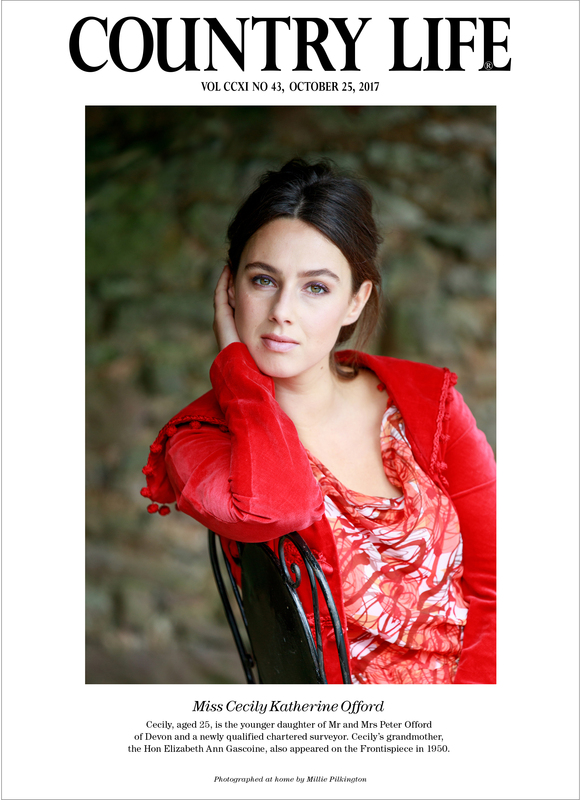 Indeed she still works as a freelance journalist and public speaker, she presents ‘From our own Correspondent’ on Radio 4, is ambassador for various charities, and has written 5 books – including her best selling autobiography, ‘The Kindness of Strangers’. I think this photo captures the essence of this remarkable lady – intelligence, humour, integrity, determination, strength and charm. I’m just surfacing from a crazy couple of months of photography, with back to back weddings, school marketing & prospectus photoshoots, family portraits, Country Life editorial and frontispiece shoots, sculpture and new product shots and so forth. The highlight however was being commissioned to photograph another incredible Middleton wedding. As the official photographer for Pippa Middleton & James Matthews’ wedding, I captured the bridal preparations, church service, formal groups, reception, speeches, departure and of course the fantastic party in the evening. It was a tremendous day and huge honour. 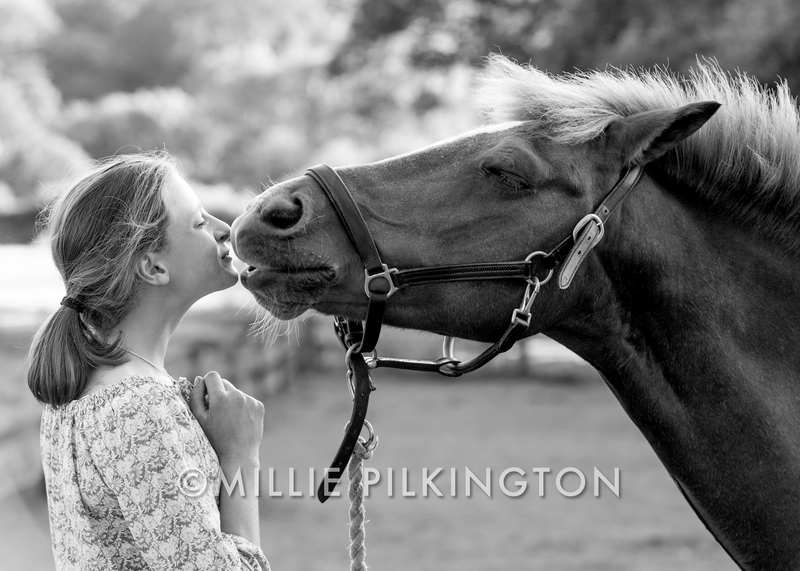 I am one lucky Dorset photographer! I would like to thank Dan Pangbourne, a fantastic photographer and great friend, for his help in setting up the lighting for the formal group photographs. These were a great success and I’m thrilled with the final images. Working alongside with me for the rest of the day were photographer Matt Porteous, and film makers James O’Garra and Patrick Gather – all of whom were a joy to work with.